As a form of celebration with the nation, I decided to pay a visit to the Zoo in morning, and get home by afternoon so that I would be in time to watch the live National Day Parade on TV. We had our good friend & her family to join me, too. To visit Singapore Zoo, it wasn’t just about the animal exhibits anymore. 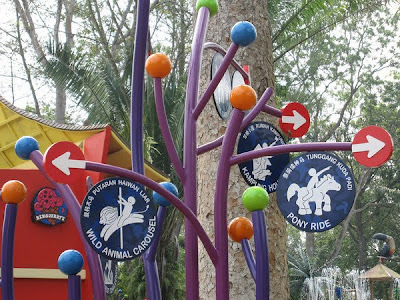 Another more thrilling reason to make a return visit, was to bring the little one to this newly revamped kids wet playground as well as the new boat ride! The Rainforest Kidzworld offers an extensive water playground with few water slides, and the massive bucket filled with water that gushes out to create a waterfall effect excites the kids most. There is also other water sports and activities, such as, pony ride, carousel ride and an ‘open house‘ featuring life of ‘kampung‘ (village), but the highlight of this kampung house has to be the displays where those tiny creatures skulking in the cupboards, drawers and rooms of this kampung house. My friend’s little one (aged 3) had so much fun at the wet park for more than 1 hour (see more photos in my FaceBook – search ‘My Wok Life’ or log on from my side bar). It was kinda refreshing to get yourself wet, after a long half-day walk from one animal exhibit to another under the hot sun. To enjoy the water play, remember to bring along extra set of clothes. 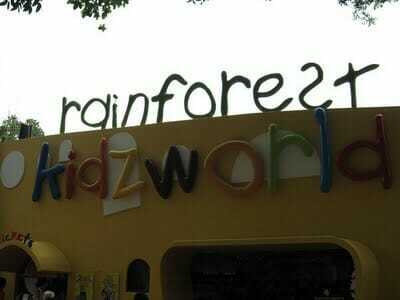 Rainforest Kidzworld admission is included in the zoo admission. However, it does not include any additional rides. Only the water playground and visit of kampung house are ‘free‘. Expect to pay about $6 per ride or $10 for any of the 3 rides at the Kidzworld. There was another attraction in the zoo, the new boat ride. 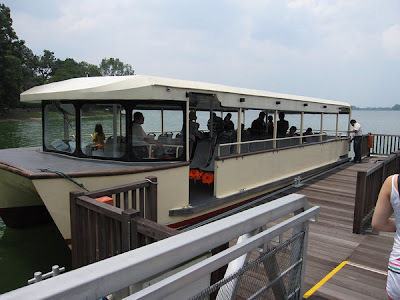 You would get to take a ride on the boat for 15 – 20 minutes long, and to fascinate the unblocked view of Seletar reservoir along the ride. 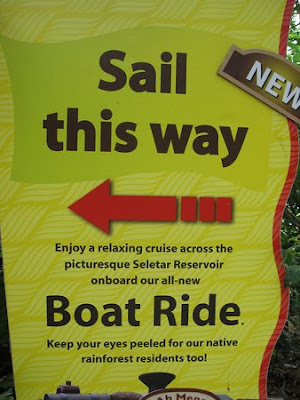 However, do not expect any spectacular view or special appearance of animals during the boat journey, there wasn’t any. Oh yes, there was a group of kingfishers resting on the tree branches. Price? $5 for a single trip, add $1 more for return trip. Or, like us, get the 3-in-1 Zooper-saver ticket at $25 (for adult) & $19.50 (for child aged 3 – 12), which consists of admission fee to the zoo, tram ride and single trip of boat ride. If you go on normal days (I think it includes weekend), just NOT on a public holiday and eve, you should be entitled to 30% discount, with OCBC or POSB credit card. Check at the ticket counter. Oh well, it was very nice weather, windy on a cloudy Sunday morning. We enjoyed the elephant feeding during our visit. Let’s continue the giraffe feeding this time! Price per feeding remained at $5. And, please expect a queue with only 10 places for each feeding time (usually 2 times per day). So, wait at the designated gate earlier. Check out the animal’s feeding time, and plan for your itinerary ahead to avoid disappointment. If you are looking for a picnic spot in the zoo, there was this nice cooling reservoir-view spacious little hut equiped with benches and fans, located just not too far after the girrafe enclosure.